Pithamagan is not a film for the faint hearted. Like other Bala films, it deals with society’s poorest and most disadvantaged – in this case, he delves into the world of cremators, petty con artists and drug pedlars. And yet it’s very watchable, with excellent performances from Vikram, Suriya and the rest of the cast making Pithamagan much more than just another film about the miseries of being poor and outcast. The focus of the film is the relationship between Chittan, an orphaned cremator and Sakthi who is a small time criminal. Chittan is born in a graveyard and brought up there by the cremator who seems to do his best for the child. However Chittan grows up to be unable to deal with society; he cannot communicate in words, and is unable to understand the basic tenets of normal behaviour. After his guardian dies, Chittan ventures into the local town where he creates mayhem before being rescued by Golmathi, a local cannabis dealer. He ends up following Golmathi home, and since she has a kind heart and feels sorry for another orphan like herself, she helps him to find a job. This turns out to be at a cannabis farm and when it is raided by police, Chittan ends up in jail. There he meets Sakthi who also feels sorry for Chittan and tries to help him cope with life inside prison. Sakthi is a petty crook who runs street tricks and confidence games which seems to have given him a performers approach to life. He has a sunny disposition and a positive outlook despite his circumstances and occasional rather interesting dress sense. After Sakthi is released from jail he works with Golmathi to secure Chittan’s release, and along with Manju, a student who was once victim to Sakthi’s confidence tricks, the friends then spend most of their time together. They work on improving Chittan’s appearance and behaviour, and try to get him away from the drug trade with mixed results. However, the local drug baron has other ideas and the final conclusion is as bloody and gruesome as you might expect. While the story itself is rather predictable, overall the film works well and this is down to the chemistry between Vikram and Suriya. Vikram seems to be able to take any disability and make it instantly realistic. I really believed that he was blind in Kasi and here he is totally convincing as the mentally disturbed Chittan. His facial expressions are just perfect and he really does appear to be totally wild and uncontrolled. It’s hard to define exactly what Chittan’s problem is, but as a scientist (and brain researcher!) I’m immediately intrigued and want to analyse the cause of his condition. Is he simply a wild child – raised without the benefit of society and therefore unable to function within its rules? Or is it more organic and he has a functional neural developmental problem? I tend to favour the latter as the cremator who took him in was able to speak and obviously had some idea of how to interact with the townspeople. So the total inability of Chittan to communicate and relate seems to be something more than just growing up with little social contact. It also doesn’t explain why he was able to fight so well, but obviously that was essential to the plot and we can’t ask for too much realism I guess. I love that he left the policeman upside down in the shot below – the fight scenes really were good in this. I also find it interesting that in so many of Vikram’s films, his character is somewhat crazed, and he is completely convincing each time! But as good as Vikram’s performance here is, I think that Suriya manages to equal it. This is the first film where I have really ‘got’ Suriya’s appeal. I’ve seen him in a number of films and while I thought he was good as the cop, or the good guy, or even as the bad guy, I’ve never felt that he’s been anything more than that . But Suriya is absolutely fantastic in this film. He is funny and charming, and breathes life into the story. Most of the comedy comes from Sakthi and his various cons, and without this balance Pithamagan would have been very grim indeed. Suriya’s character has plenty of flaws but at heart he is kind and his relationship with Chittan allows this side of his character to flourish. Sakthi’s friendship with Chittan is cleverly developed throughout the story and makes it credible that the two would end up as constant companions. Chittan seems initially perplexed by Sakthi’s benevolence towards him but soon realises the benefit of a friend. And later, Chittan’s obvious jealousy when Manju is spending time with Sakthi is both childlike and logical since Sakthi has become the centre of his world. Sangitha is perfect as Golmathi with her paan-stained lips and philosophical approach to life. Her character is another orphan and her initial pity for Chittan seems similar to how she would feel for a stray dog. But as a drug dealer and someone who is shunned by the local community (unless they want her product), she is able to empathise with his alienation and is the first person to start opening up his world. Golmathi’s emotions and reactions are all plain to see on her face which helps make her character much more sympathetic. On the other hand, the first time I watched this film I really didn’t like Laila’s character and felt that she over played the schoolgirl. But on re-watching, I think she was supposed to be a fun character with a sense of adventure and an awareness of the possibilities of life which was intriguing to Sakthi. However I think Manju is a much less believable character than the others, and her presence is often more irritating than anything else. Initially her father seemed to be quite strict, even taking her to the jail to beg for Sakti’s forgiveness for her actions, which in itself seemed a really strange thing to do. But then later on in the story, her family seem to let her do whatever she wants, despite knowing that the man she is involved with is a convicted criminal. They do turn up to support Manju in the end, by which time it seems to be too late and is perhaps just a way to make a contrast to the other characters whose only family is each other. Manju’s presence also provides another dynamic to the relationship between the two men since she becomes a barrier between them. But my biggest issue with her character is her inability to articulate what had happened to Sakthi, and this is a major flaw in the story for me. While I’m quite sure that in real life people become too distressed to be able to communicate, here it just didn’t seem to suit her personality, even allowing for her youth. It was also just a bit too over the top and filmi for a story that relies so much on gritty realism – at least for most of the film. There is one other odd note, which is the protracted interlude with Simran. This completely changes the nature of the film and lasts just a bit too long. In fact it reminded me of the Hindi film Shakti, where Shah Rukh Khan turns up for an item song and ends up taking over a large part of the final scenes. While the song here is fantastic, and I love it, it stops the flow of the story and the subsequent scenes initially feel out of place as the pace abruptly changes again. 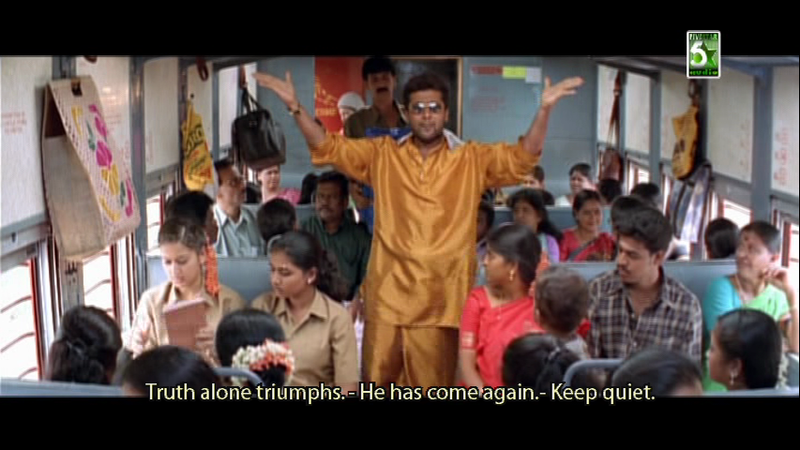 But here it is anyway, since both Simran and Suriya are brilliant and it’s very funny. 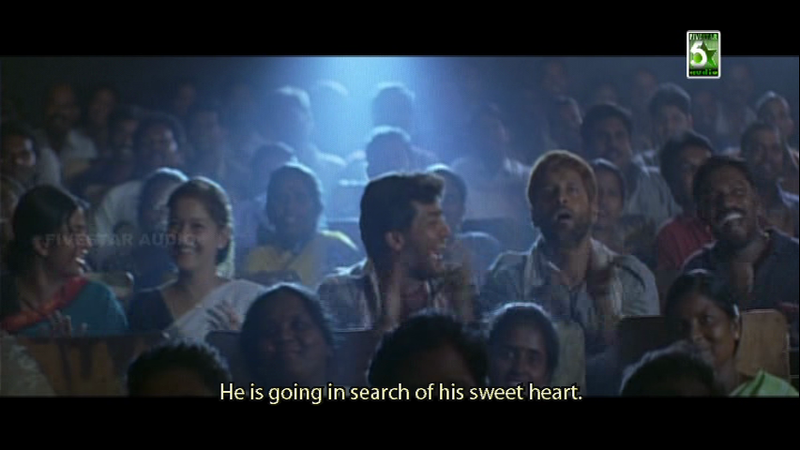 I think Pithamagan is an excellent film despite a few flaws with the pacing. The friendships are successfully portrayed and the action is fast and well choreographed. Vikram’s grunting and animal noises are interesting and effective, and so much better than his singing which is absolutely brilliant in its tonelessness. I wonder just how hard Vikram had to work to make it sound that bad! The music by Ilayaraja is quite beautiful but not particularly memorable, especially since it’s often used as a backdrop for more of the story. Overall though it’s the performances that make this film worth watching and I would recommend it for Vikram and Suriya who are both outstanding. 4 stars. This entry was posted in Kollywood and tagged Bala, Illayaraja, Laila, Pithamagan, Sangitha, Simran, Surya, Tamil, Vikram. Bookmark the permalink. Nice review; It is one of Bala’s finest like Naan Kadavul. Vikram was just fantastic in this film and the national award was rightly deserved……. I watched “Avan Ivan” (his latest) last week but sadly that film sucked big time……. was a big let down! That quote from Bala really does sum up this film well – it really is all about the relationships and Vikram and Surya really do have some great chemistry on screen together. Reading the reviews (and your opinion here too 🙂 ) I think I made the right decision, although I’ll probably watch it on DVD when it’s released. Such a shame though as his previous films all seem to have had great reviews. I don’t love this movie but do love the performances of Vikram (who won the National Award for this role) and especially Surya. I loved the sequence with Simran. Btw, the actress playing Manju is Sangitha and not Laila. Laila plays Gomathi and I found her a little annoying too. Vikram and Surya really are fantastic and their interaction is definitely why I enjoy the film. I almost expect Vikram to be good though – in every film I’ve seen him in he has been excellent, but this is the first time I’ve thought that Surya really lived up to expectation and delivered a really good performance. Perhaps I just haven’t seen his best films, but this film inspired me to try and find more. I do have a friend who has recommended a few, but they are very hard to find with English subtitles. But I will keep looking! Surya is a great actor………. I know (from reading your earlier posts) that you did not like him in Aayudha ezhuthu…. but I personally thought that he was great in that role…..one if his finest……. Thanks for the recommendation – I have this film and think Surya is very good in it, but I still prefer his performance in Pithamagan. I think it’s the combination of the partnership with Vikram and that his character has more comedy and light hearted moments. Plus he’s quite charming as the con-man! Kaakha Kaakha was my first Surya film and he was impressive enough that I watched another one of his films – Singham. 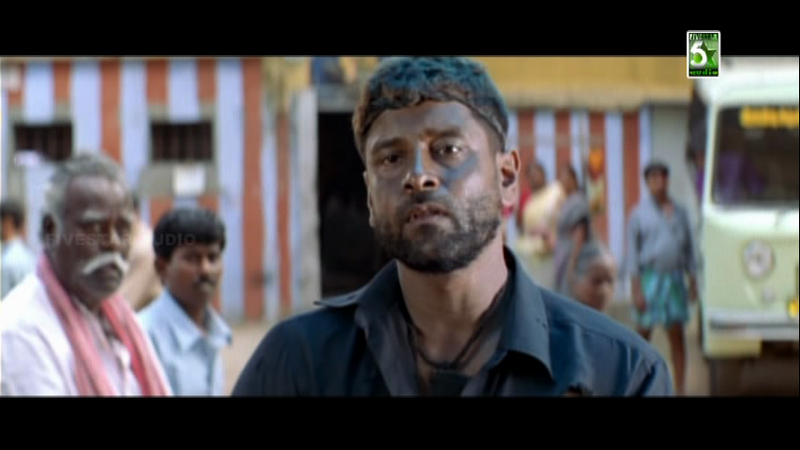 In both of these he is the all-action hero and a more serious character, so it was good to be able to see a different side to him in Pithamagan. But so far that’s all I’ve seen, and there are many more of his films that I want to watch – the list of films to find just keeps getting longer! the first part is not in audio/video sync but the others are ok.
Just thought you should know.. But basically I really liked Sangita’s portrayal of the drug dealer and wasn’t so keen on Laila’s screechy student! It’s a great film though and I’m waiting to see what Bala comes up with next. Although it didn’t get totally great reviews I’m also impatiently waiting for Avan Ivan to come out on DVD! It seems to take so long to get a DVD release for Tamil films these days, especially with subtitles! I have this one at the top of my queue, though I’m afraid I have dubbed version of it… Yikes! I don’t like dubbed versions and your comments about Vikram’s noises and sounds make me worried that I will be even less happy if the dubbing doesn’t stay true to the original… Ufff! I know what you mean about dubbed films. I try and get the original where possible, but it’s sometimes absolutely impossible to find a subtitled copy, especially with Tamil films! Do let me know if the singing is as toneless – I thought that it was brilliant and really helped define the character for me. The Tamil version is on YouTube with subtitles if you want to compare 🙂 I’ll be very interested to hear what you think about it. I found it not always easy to watch, especially towards the end, but it is compelling and I have to say it just gets better every time I re-watch. Pithamagan was more about the chemistry between characters of Vikram,Suriya,Sangeetha and Laila. This chemistry makes it more entertaining than Bala’s next ‘Naan Kadavul’ whose lead is so much Deattached from the world. Here Vikram’s Performance was outstanding. While Suriya and Sangeetha were also awesome. Laila was ok with her chirpy character for enlightenment of script. Climax was so gruesome ,yet believable. It’s the most ‘Perfect’ movie of Bala.